Sigma Beauty Affiliate Program: Unique Sigma Products + GIVEAWAY [CLOSED]! Sigma offers an array of products for people to choose from, but we’ve picked out the Top 5 products that are “Uniquely Sigma”. By promoting these products to your followers, you are showcasing one of a kind Sigma items which can give you an advantage when it comes to securing a sale. Making these products and their unique features and benefits known to your followers is a great marketing technique. Emphasizing the benefits could persuade potential customers to purchase Sigma over another brand. When reading through the following product features, try to think of the benefits each product will provide to your followers specifically. The Mrs. Bunny Essential Kit comes with 12 must-have brushes to start or add on to your makeup brush collection. All the brushes are constructed with Sigmax HD filament and come in a convenient cup holder to travel with or store your brushes. This is a great set to market to your eco-conscious viewers, as the materials are 100% Vegan friendly! The kit also comes in a travel version featuring seven of the original Mrs. Bunny brushes. Our newest product is meant to fulfill your every brow need. 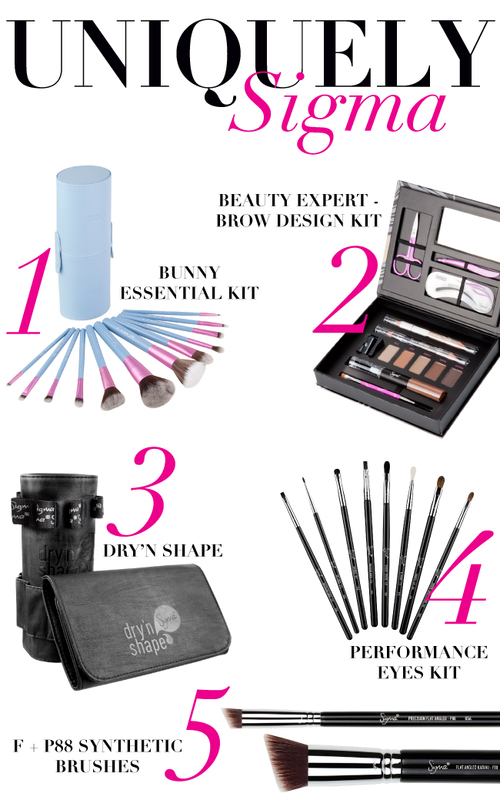 With 15 pieces, you can arch, shape and groom your brows with the help of this one kit! Highlights of the kit include a scissors, tweezers, stencils, brow powders, brow gel, highlight and brow pencil, brow brush and pencil sharpener. Sigma is also releasing video tutorials which teach you the different uses for the tools included in the kit. These tutorials are a great way to market the Brow Kit to show your viewers the variety of looks they can achieve. This revolutionary product dries and reshapes your brushes in 4-6 hours. It is a must have accessory which helps in prolonging the life of your brushes. This knowledge is essential for marketing to your viewers as brush care is very important in supporting the longevity of your cosmetic brush investments. The Performance Eyes Kit is the perfect assortment of brushes for the precise application of liquid, cream and powder eye products. This set was designed for advanced makeup artistry, but is a fabulous addition for anyone’s kit from beginner to advanced. The kit includes 8 brushes used for: lining, tightlining, lining the waterline, smudging, blending, and shading the crease, inner corners and lids. Although anyone can use this kit, it is perfect for those with a smaller set of eyes. These two brushes are the newest addition to our Sigmax Synthetic line. A blend between the F80/P80 and P80/P84, these brushes are already popping up in monthly favorite’s videos. The F88 and P88 brushes are great for liquid and cream products, especially on hard to reach areas of the face--more specifically, the cheekbones and contours of the nose. These are a great set of brushes to recommend to first time Sigma users. You can purchase the brushes individually, as a complete kit, or in their respective kits: Synthetic Kabuki and Precision. Remember, the key to successful selling is to provide your followers with the direct advantages to them. Emphasizing the benefits, rather than the features is a must and since you know your followers best, it is up to you to decide how to highlight these benefits to them. For example, your followers aren’t going to buy the Dry’n Shape because of its size dimensions and material. They are going to make a purchase because they want to keep their brushes in good condition and save time waiting for their brushes to dry and reshape. Another tip to remember--share the monthly coupon code with your followers if you know they are budget conscious. We hope that these descriptions have given you some insight on the selected Sigma products and provided you with the information to properly market these items! The Sigma Affiliate Program would like to provide five of you with a Top 5 product by entering our giveaway*! Please comment below with a Sigma product from the Top 5 list you have always wanted to try and we will choose one winner from each product category and announce on Friday, August 24! Must be a Sigma Affiliate to enter. Contest will run August 9-24, 2012.Contest will close at 12 Noon CST on August 24 and winners will be announced shortly thereafter. Thanks Leanne, and good luck! Thank you! We're happy you like the post! Just entered, how exciting :)! This is such an amazing opportunity! Sigma you never cease to amaze me with how interactive and on top of things you are! Most other companies that offer affiliate programs make NO effort to ensure the affiliates have the tools & knowledge to be successful! Kudos to you! That you Caateryna! We're so happy to hear you are enjoying the program! Good luck in the giveaway! Just entered, I am really exciting. Ty for the opportunity!! Wow, this is an awesome giveaway for the affiliates. :) Thank you for a great opportunity Sigma! uau! esses pinceis para olhos sao o maximo! Miki, you can use the "Select a Language" feature on the left side of the blog! I just entered :) im so excited ,its so difficult to choose which one i wanna have.Kudos to us! in stock right now?? =) because it's an AMAZINg pink color after seeing it on you tube for reviews!!! Yes, the Make Me Blush kits are available on our website! Great giveaway! Theproducts are awesome, it'd be so hard to choose! Thanks for the opportunity! Dry and Shape + Bunny Essential Kit for sure!!! Have the travel kit but the entire collection will just further help me to learn and allow me to do what I love! Entered! I so wanna try the F88 and P88 brushes. Where can you find you affiliate ID? thank you so much for the opportunity i just entered.. i love sigma brushes my fav. hupe this is my chance to win a give awat from sigma.. thank you.. Thank you! Make sure you use the application form above to enter the giveaway! I love Sigma giveaways! Keeps all affiliates so excited :) Thanks again for the great opportunities Sigma! I've recently come across such bad experiences with other affiliate programs. (One in particular.) I am so glad you guys are so upright. Keep up the great job! Thank you.... this is really A M A Z I N G! I hope to really Try the Brow kit, It seems soo much easier to have all of your brow necessities in one kit! I could sure use some brow tuning :) Thanks for the post! Hi Jessica! It definitely does contain everything you need for your brows! WOW!! Very good idea! I would like to try Performance eyes kit!! I just entered, and I'm really interested in trying the Bunny Kit! Um sonho esse kit #amo!!! Awesome giveaway! I love your drive and how you like to involve us affiliates. Thank you for the fantastic giveaway opportunity! how do I to affiliate the blog? Hi Paula! You'll need to visit our website and submit an application to become an affiliate: https://www.sigmabeauty.com/Articles.asp?ID=253. Please let us know if you have any questions! Hi Aninha! All winners were announced over Twitter and contacted through email. Thanks!